What we like about the SCRIBZEE® app is that it lets us be as spontaneous as we like when we take notes, with the assurance of being able to access our digitised content anywhere and anytime. It’s a two-step process: 1/ you write notes; 2/ you scan them. So, the question is: when is the best time to scan your notes? As soon as you’ve finished taking notes or some other time? Is there an ideal frequency? To answer these questions, let’s weigh up the respective benefits and drawbacks of each method. 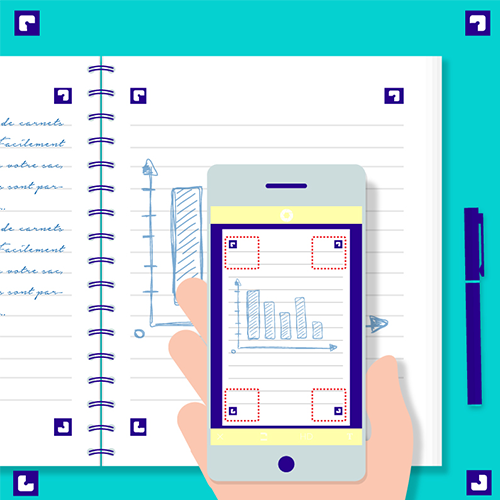 In other words, just before leaving the meeting room or classroom, you scan your handwritten notes with the SCRIBZEE® app on your mobile phone. Quick win No. 1: for your notes to be usable later on, they must be legible and understandable by the “Future You”. So, you’re going to read them over on the spot, fill in any gaps and quickly rewrite anything you might have simply outlined or scribbled down. Spending a minute or two clarifying your notes while they’re still fresh will help you memorise the content and make you more efficient. Quick win No. 2: you get into the “write/scan” habit. The good thing about a habit is that you don’t have to think about it: that means one less thing your brain has to remember. Once it becomes a habit, you can’t forget it. Quick win No. 3: you can share the contents of your notebook with colleagues or classmates straight away, using SCRIBZEE’s sharing feature. Drawback: if you’ve got back-to-back meetings or lessons, you might feel you can’t spare the minute or two it takes to scan the notes you’ve just taken*. You pick a convenient time to scan the notes you’ve taken over a given period of time all at once, using your mobile phone and SCRIBZEE®. Quick win No. 1: you can read over your notes after a good night’s sleep before scanning them. This gives you a chance to expand, fill in gaps and select what is really worth scanning. Quick win No. 2: peacefully scanning page after page of notes can be quite relaxing, like any activity that doesn’t require much concentration. Especially as images scanned with SCRIBZEE® are excellent quality right from the start: no tweaking required. Quick win No. 3: you have a complete picture of everything that’s happened since your last scan: a good opportunity to step back and review how things are going. Drawback: you might find it a bit difficult to reread your notes or put them into context. Some people find the repetitiveness of scanning makes them keep putting it off. How often should you scan your notes if you scan in batches? If you wait too long between two sessions of scanning with SCRIBZEE®, you might find the operation a bit long because of the stack of pages to scan. We tend to put off till later anything we consider too time-consuming. But if you keep putting it off, you’ll soon find yourself with part of the information on paper and the other part already scanned in your Oxford cloud, which could get confusing! This is why I’d recommend never leaving more than a week between two scanning sessions, if you choose this method. In short, to decide how often to scan your handwritten notes, the trick is to choose the method that allows you to be sure of the quality of your notes (when is the best time to read over my notes: immediately after taking them or at a later time?) without feeling that scanning is taking up too much time (straight away, so it’s over and done with? Or every Sunday evening at 7?). Previous Post:With SCRIBZEE, your mid-year exams are in the bag! Next Post:Tips for a stress-free bac !